These are not fab like Angie’s examples and I have very little light blue but took a stab at this ensemble. 1/2: What I am wearing today with a few inches of new snow. The light blue for spring plus black KUT jeans with black boots kept things real. The plaid shirt has blues, black and white and is my “print” for this exercise. I added the scarf with lighter blues for some maximalism. 3-5: The denim duster outfit is old and something worn last week over a column of black with white floral brooch added to a chain as a nod to spring. What do you think? I welcome your suggestions and comments. I felt more quirky than fab in these outfits. I love both, especially black with duster. Lovely silver shoes. CUTE MULES. Who made them, Joy? Both outfits are fab, and you nailed it. 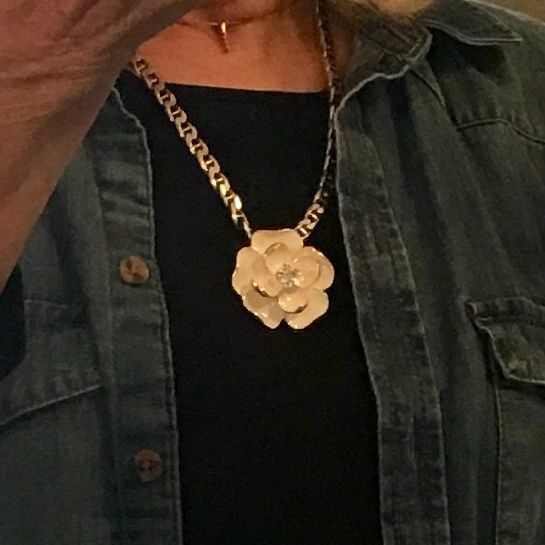 The "rose necklace" is gorgeous - nicely done. Thank you, Mirjana, Angie, and Katerina, for your lovely comments. Angie, the mules are Naturalizer and a month or so old. I found them at The Rack and they stay on my feet! I walk fast so most mules do not. These are a bit higher on the sides toward the front, than most. I was very happy with the brooch "rose necklace". It was a bit of shine where I needed it. Katerina, this denim duster is a bit wider than I'd like, but wide enough to do up and wear as a dress. It is from Target last year. The light blue cardigan of the first outfit is Eileen Fisher from a few years ago and matches a sleeveless linen dress, which is why I still have the cardigan. The back is slightly gathered, so nicer than a regular cardigan. Great outfits! I like both, but especially the second one. The blue sweater seems to lighten your face and is such an amazing color on you. Cute outfits. I agree light blue is a very good color for you. I’m really liking the sweater over the plaid shirt outfit! Light blue is a great color on you! Yay, good to know that several of you like this blue on me. Your comments are very helpful. I usually stick to warm shades so wondered about wearing blue. You make quirky look fab! I like both outfits very much. I prefer the plaid shirt untucked on you. Oooh the denim duster with black and your rose brooch looks amazing! I never thought I needed a denim duster before....now I think I might! I love the second outfit. The long lines and ankle pants suit you very well. So do the amazing mules! Thank you, Mainlady and Smittie, for the helpful comments. I wondered what others would think of the duster outfit. It is great to have your feedback. Both outfits are great, but my favorite is the second one. As always, I loooove your footwear and accessories choices. That rose necklace is beautiful, and so are the mules. Thank you Dianna. We are getting a bunch of snow so the mules will be put up in favor of boots awhile longer, including for Easter Sunday. I love the accents you have in your photos--the scarf and rose necklace. I would never think to mix a floral print with a plaid, and it works really well. Exciting to see a real-life application of black and pale blue. Thank you, Carol. Florals and plaids are fun to mix. I'm happy that you think it works. Absolutely fab with fantastic proportions and extremely good fit. Light blue complements your hair, and you have managed to liven up a color that could potentially become too flat, too boring, by adding a little bit of clever pattern mixing! The second outfit is very dynamic, it looks like you could (stylishly) accomplish a million things in this. I would copy you for sure for when I go out with friends or teach or write or paint or go fo a long urban stroll. You wear the metallic flat mules better than anyone else! I think both are stylish and the blue color very flattering on you. Winners! Krishnidoux, you make me blush. Cocolion, thank you.